Den wen u making deh commints ur name iz a link 2 a web page. Dis will NOT gibbing u deh abatar. U will needing deh Gravatar akkownt 2 getz deh abatar. If u b needing deh halp in reglar Inglish: I give you instructions using myself as the example. Go to the Cheezland page where you want to make a comment. At the bottom of the page is a box that you write your comment in. Wunst u haz fillinged dis info in, deh pooter will remembering it, and u duzn’t haz tu typing it in fur eech commint. But u kin changing it if u like. note dat u ken putting ennefing in2 deh URI line. Ennyfing at awl. Deh address iz not chekked for validitee. If u putz in a bad address, it will taking peepz to nowhereland. u musting 2 get a gravatar.com account. eezee peezee, just go to www.gravatar.com and den following deh strukshunz. First u enter ur email address. Den u kin upload an image tu use as ur gravatar. u will b able tu crop deh image after u uploadz it. U kin changing deh image by adding more pixors. u kin add uzzer emayo addresses and haz a separate pixor fur eech email account. Now when u makez a comment on deh web (nawt just in Cheezland, but menny places [nawt Faceook]) ur avatar will show up. U kin LOG IN tu cheezland — if u hazn’t got a Cheezland account look at deh bottom uv deh Cheezland sidebar and click on Register. Fill owt deh required info. Even tho it sez “wordpress” u am registering fur an account in Cheezland. See dhere in the smaller print? 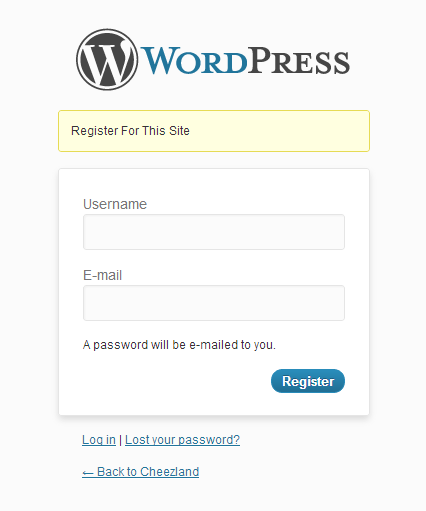 It sez “Register for This Site.” Being logged intu Cheezland am nawt deh dhe same az being logged intu WordPress. U kin haz deh same oar a different name in ur WordPress account. Cheezland will sending u a nee mayo wif a password. Get it, den go bak tu Cheezland and finish setting up deh account. Rite now, unless u b a moderator, dhere am nawt much u kin do wif ur Cheezland account. But PK am looking into adding public profiles and messaging. Dis b sum grate AVATAR strukshunz frum ower gud fren Lunarmommy fur doctoring deh images fur deh hollydaze, etc. Do you want a Festive Avatar (or any avatar at all besides the qwiltie fing)? Are you using a computer at work and can’t use an image from your computer? Or don’t have an image on your computer to use? Ta-da: you can now TRANSLOAD an avatar to your WordPress Account!! (Transload means to load an image from somewhere else on the Internet, instead of uploading from a computer). I’ve experimented, and these instructions, which I’ve tried reelly hard to make frendly for those hoo aren’t knowing much abowt computers, should work (hopefully; see disclaimer at the end of this paragraph!). But if you’re using a computer at all, you should be able to handle this. These directions are for Windows; Mac is probably similar, allowing for the single-button Mac mouse. It’s okay to fiddle around and experiment if you aren’t quite sure what to do; you (probably) won’t break your computer or the Intertoobs. Lunarmommy is not responsible for websites or the Intertoobs not working right. to COPY: put the cursor (the little line that moves around when you move your mouse) at the beginning of what you want to select. Press and hold the left mouse button and drag the cursor to the end of what you want to select. A dark highlighting will cover the selection. While this highlighting is on, press the CTRL key (bottom left corner of your keyboard) and hold it down while you press the C key on your keyboard. the selection has now been copied to your computer’s inbizible virtual clipboard. to PASTE: after you’ve copied something, find the place where you want to put the selection, click your mouse in that spot, then press the CTRL key and hold it while you press the V key. vwahlah, your selection should appear in the box or area where you wanted it. Speaking of copy and paste, you may now want to COPY these instructions, PASTE them into notepad, and print them out. 4 – paste (ctrl v) the URL of the picture you made into the URL box. This should load your fundraw picture onto your profile. If you don’t like the options at fundraw.com, you can transload a picture into pikipimp.com. Note: I couldn’t get this to work with Firefox, only with Internet Explorer. 5 – a box will appear that tells you the web address of the picture. this will be something like http://website.com/images/cat.jpg. make sure you maximize the size of the box to get the whole address!! the address needs to end with .jpg; this is the kind of picture file type that is most likely to work. 10 – your picture should appear in the screen. Next to it is a menu of different things you can decorate it with. Chose your category, select your decoration. 11 – click on the decoration, a box will appear around it. click and drag with the cursor inside the box to move the decoration around, click and drag on the corners to change the size. when you’re done, save. 12 – on the page with your saved image is a panel with a box with the address of your picture. You can now follow steps 2 – 4 above. Your new avatar will appear on the screen in the gravatar avatar-doctoring window. It may be blown way up and look blurry or pixel-ly. This is just so you can crop the picture to the correct square proportion. make sure you crop closely to the most important part of the picture – since the avatars are reelly reelly small, you don’t want extra stuff in the picture taking away space from the main part, for example, a cute kitteh head wif a festive hat on it. Once you’re done putting your noo avatar on WordPress, be patient!! It may take several hours or even to the next day for your avatar to start appearing on comments! But if it shows up on your WordPress dashboard, you know you’ve done it correctly. NOTE FOR EVERYONE: before you can see new avatars you may need to clear your cookies and/or your cache. this is under “tools” for firefox, click “clear private data,” make sure only “cookies” and “cache” are checked. myself, i’ve been able to make avatars appear just by clearing the cache (these are images the your browser saved from before, to load quickly instead of waiting for new ones. you have to get rid of these.) on Interwebs Exploder, it’s “internet options,” “general” tab, “browsing history,” “delete” button. delete your temporary internet files and cookies. duz mai abatar luk blu? On deh Cryer, it b a reddish brown…. Ur name b a link tu ur ICHC profile!!! Ur abatar haz werdz tu reeding wen I rollz over it!! W00t!!! U haz exceeded expectations!!! Dis a test. Ai has ICHC profile an WP profile oar 2 oar free… Ai nefur noes whitch avatar ai’ll see! Dat silly tabby is Victor. Fankies veri much for theis info!! !